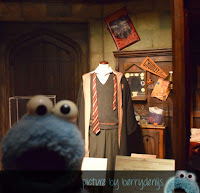 Cookie Report: You’re a wizard Cookie! 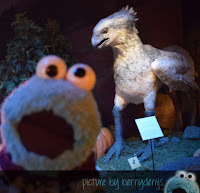 Last week me received a letter from little Hedwig to come to Hogwarts. First me was sorted by the sorting hat and then… Then me went to the Common Room. 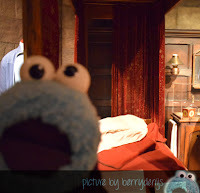 Me even got to see the bedroom of Harry and Ron! 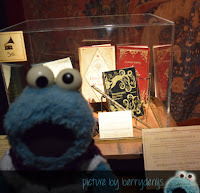 Wow it felt like a dream… maybe it was a dream… Well actually me went with Berry to the press preview of Harry Potter The Exhibition and it was amazing! Let me tell you all about it! 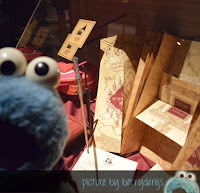 O and if you can read Dutch, please visit Berry her blog about the Exhibition: De magische wereld van Harry Potter. But first… me will tell you about the awesome day me had. Berry knew for a little while we would be going there, so she knitted me a Hedwig sweater so me would go with her in style. At the Cinemec in Utrecht (this is a huge Movie theatre complex) they have built a new hall there especially for the Exhibition. The moment we stepped in me felt like me was going to Hogwarts. The train is there, at the school station. And all the props and costumes of the movies. In the Common Room there are the wands of Neville and Hermione, and in the bedroom of Ron and Harry you can see what they kept in their trunks. And the golden egg is there. It amazing. After me visited the school and its classes it was time to go outside the school. There you could play Quidditch and visit the garden around Hagrids hut. Me even sat in Hagrids chair at the cabin and saw the dragon egg on the table. 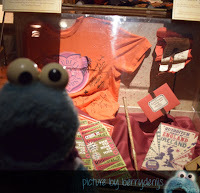 And me even saw the Monster books in the cupboard. 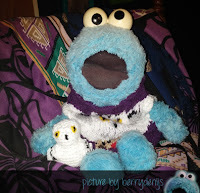 Me no think there is an entry in the book about cute little blue monsters like me… what do you think? 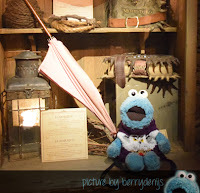 It was so nice in Hagrids hut! We even strolled through the magical forest and went to a feast in the Great Hall. 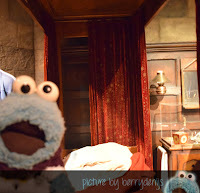 The Dark Arts chamber was a little scary though – there was a Dementor! – but also very fascinating. Me was glad when we left though. And then something amazing happened! 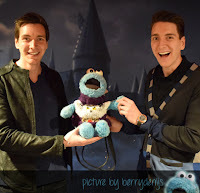 Berry had an interview with James and Oliver Phelps, the twins that play Fred and George Weasley in the movies. They were soooo nice. And Berry arranged a little photo moment with me. Awesome huh. Berry had their picture taken with them too. Me thought it was marvellous. Me really loved it. And the exhibition! It really felt like me was a day at Hogwarts, for sure. 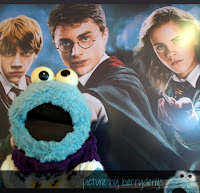 Me even thought Hagrid whispered: 'You're a Wizard Cookie…' hihi. O wow Liam! That sounds awesome too. Berry absolutely was fingirling all day! She loved all of it. So me totally understand! Thanks for your sweet comment buddy! 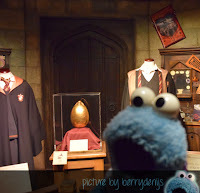 What a great time you had at the Harry Potter exhibition! Your sweater is perfect! Did the Weasley's want one too? hehehe. 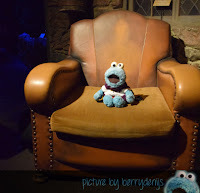 Me learned how to make magic cookies at Potions and me was sorted with Berry into Gryffondor!!! We had a great time. Hihi they thought it was rad! And they really liked me tee hee.